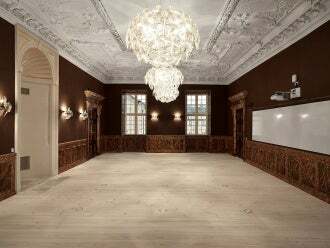 Artcoustic is proud to been chosen as the speaker supplier for Frederiksberg Castle in Denmark, as part of a prestigious project. Artcoustic Loudspeakers were chosen for their high-quality sound and design aesthetics. The company was the perfect match for the project, as it manufactures bespoke speakers, according to purpose and colour preference. All of the speakers installed were made to match each room and the front of the speakers was printed in Pantone colours specified by the architects. The models used were: SL-C1 and SL-Target. Two rooms of the project are currently complete and more rooms will be added at later dates. Frederiksberg Palace was built by King Frederik IV on the top of Valby Hill, one of the highest areas in the outskirts of Copenhagen. The palace was designed in Italian Baroque style and the park’s landscaping was inspired by the gardens of France and Italy. The palace was first built from 1703 and finished in 1828, after a refurbishment. Visit the company website for more information about the project. Image: Artcoustic loudspeakers for Frederiksberg Castle were designed to match the colour of each room. Photo: courtesy of Roberto Fortuna.